For any batting order to have a settled look to it, it is important that each batsman knows where he is going to bat and what his role in his side is. Of course, there may be a bit of shuffling here and there based on the match situation or to keep the opposition guessing, but a batsman who knows what is expected of him and what his role is, is more likely to go in with an uncluttered mind and perform at his best. With the World Cup less than a year away, India have more or less settled in and locked down on all spots, except one. A crucial one too - that of a number 4. At the 2011 World Cup, Virat Kohli batted at that number in 5 of the 9 innings. He scored 202 at an average of 40.4, including a crucial 35 in the Final after India had lost the openers early. Between the 2011 and 2015 World Cups, 7 different batsmen batted a minimum of 7 innings at that spot, before the Indian team settled on one man- Ajinkya Rahane. 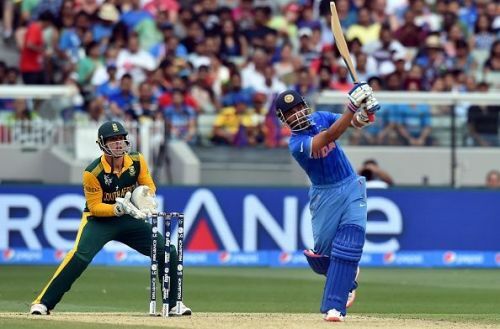 At the 2015 World Cup, Rahane did reasonably well at number 4, scoring 208 runs at an average of 34.7 in 7 innings, including a quick-fire 79 against South Africa. Since their defeat in the Semi-Finals of the 2015 World Cup, as many as 10 batsmen have walked out at number 4 for India. And yet, they have not settled down on one. There has been a lot of shuffling with no batsman batting more than 10 times at that spot. And India is now running out of time. Let us take a look at the numbers of all the 10 batsmen at this position since the last World Cup. Clearly, Ajinkya Rahane and Yuvraj Singh have been the best performers at number 4 in this period. Both average above 40, strike at above 90, have played the most innings, and now find themselves out of the squad. To be honest, the Indian team management has mishandled Ajinkya Rahane in limited-over matches more than everyone. Despite the reasonable success he has had at number 4, they have made up their minds, that he will be looked at as an opening batsman only, in white-ball cricket. With the presence of Shikhar Dhawan and Rohit Sharma and the rise of KL Rahul, even that has gone out of the window. As for Yuvraj, he has had two knocks of note at that spot- a scintillating 150 v England at Cuttack and a 53 against Pakistan in the group game at the Champions Trophy last year. However, he fell aside in the aftermath of the Champions Trophy loss and after an exceptionally indifferent IPL, has fallen way down in the pecking order- almost out of sight! M.S. Dhoni has shown a wish to bat up the order every now and then, only for him to return back to the lower middle order after an outing or two at number 4. 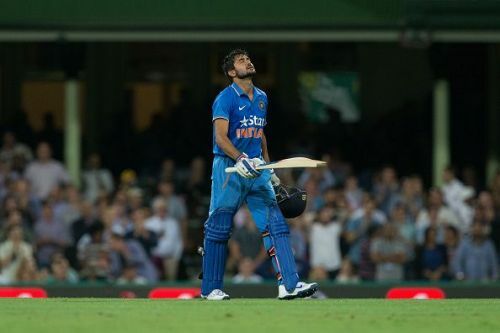 Manish Pandey sizzled with a dazzling hundred in a chase in Sydney. 3 innings later, with scores of 4*, 17, and 19, he was shown the door. He did come back momentarily, but again got only 3 innings, scored a combined total of 39 runs, and went out. As for Dinesh Karthik, no matter what he does, whether in T20 cricket or in ODIs, he just can't find a permanent spot in this Indian XI. In the 5 knocks at number 4, he has two unbeaten 50s, but still never got more than 2 consecutive innings in that position. Hardik Pandya was never going to be a permanent solution at this spot, Kedar Jadhav has been moved around here and there and Manoj Tiwary was never really there, was he? For all the talk of giving players a long rope, Yuvraj Singh is the only player who has been given at least 4 consecutive outings at number 4! That now leaves India with two of their best players at the moment- Virat Kohli, who has made the number 3 spot his own, and the latest experiment at number 4, KL Rahul- who has proven himself to be a classy top-order batsman and is in the form of his life. With a settled opening pair in Rohit and Dhawan, India now are stuck in an indifferent conundrum- two men who fit in best at number 3 and no one who fits in at number 4 perfectly. So, what do they do now? One of the two has to adjust. Virat Kohli came out to bat at 4 in the T20I series against England, sending Rahul ahead of him, and in the process sparking speculation that that is how it will be in the ODIs as well. It would have been praiseworthy, really. Here is the captain of the team, the team's best batsman, sacrificing a spot he has made his own over the years, for the sake of finding the best possible combination. But he squashed all such speculation with a steady 75 last night that guided India to another convincing win. So is India going to settle with KL Rahul at 4? The number 4 batsman in the team has to be the most flexible batsman in the team. He may have to walk in at the fall of two early wickets and consolidate like Kohli did in the World Cup Final in 2011. Or, he may come in with the top order having set the innings up and be required to carry the momentum forward or up the ante from the word go like Rahane did against South Africa at the 2015 World Cup. In my opinion, if anyone in the current Indian team is adept at adapting to the situation and the need of the hour in white-ball cricket, it is Virat Kohli. Of course, the argument that your best batsman should play the maximum balls possible, and hence bat at 3, also stands. 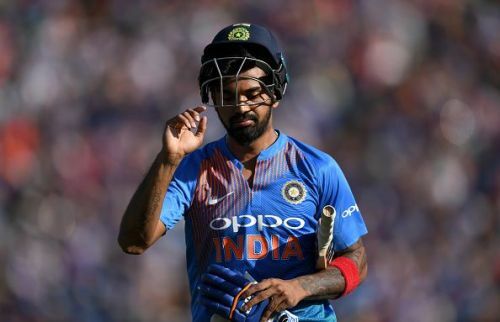 But then, KL Rahul, in the form that he is, is no lesser an asset for the team and has shown a particular liking to the new ball. Should Virat Kohli go back to where he was at the 2011 World Cup Final- at number 4? That both the batsmen are competent enough has been ascertained. That both of them will feature in the playing XI come the World Cup is also more or less certain, given Rahul's antics of late. Who among them bats at 3, and who at 4, still has a massive question mark to it. Or maybe it doesn't, and Rahul at 3 is only a ploy for T20Is. Whether India go with Kohli or with Rahul at 4, they would do well to erase the question mark hovering over it at the earliest and stop tinkering with it, giving a decent run to the man so as to make it his own.